Hello, my name is Jean-Guy Dupuis. I'm the vice-president of the Regroupement des Sauvaginiers du Lac Saint-Pierre and I'm crazy about hunting ducks and geese. This is the only spot here where we hunt ducks, because it's a wooded area. So we only hunt ducks here. As for geese, there's some land nearby where there's a lot of corn. So that's a great place to hunt them, but not the Baie-du-Febvre community pasture itself, because that's a wooded area. On the map here, you can see the large basin that was built by Ducks Unlimited. The borrow pit, shown in purple, goes all around this big marsh, and there are yellow and green sections. 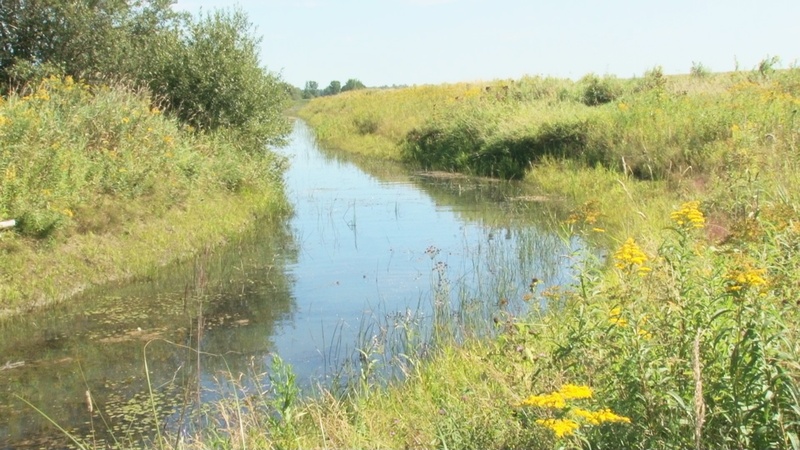 The yellow section was set up by the ministère des Ressources naturelles, and it is meant to provide fish habitat. Then there's this green part, which was also set up by the ministère des Ressources naturelles, and serves as habitat for ducks and fish. It was built in 2008. The big basin you can see was built by Ducks Unlimited; in the spring, ducks nest along this basin and in September it serves as a rest area for them. The hunters in our association don't hunt in this basin, because this is where the birds come to rest at night. We don't hunt here. We hunt nearby, but not in the basin itself. As for geese, it began in the early '80s. A population of geese started coming here. There was a simple reason for that : corn. Before that, this area was full of small farms, with 25 or 30 cows. The farmers would grow hay. Over time, things changed, and the small farmers sold to larger agribusinesses. Now the St. Lawrence valley is planted with large corn fields. And that's why geese started coming here. The more corn was planted, the more geese would come here, to Baie-du-Febvre. We hunt them in the spring because the government decided that a million geese were far too many. As long as there are more than 500,000 geese, that's according to the Canadian Wildlife Service, as long as there are more than 500,000 geese, we can continue to hunt them in the spring. We also hunt them in the fall. Now I'm going to talk about the yellow section, set up by the ministère des Ressources naturelles et de la Faune. This section was designed especially for fish, not so much for ducks. How come? Because nowadays, there is a shorter period of high water levels in the floodplain here. Because of that, spawning has to happen very quickly. Water flows into this wetland project in the spring, and the ministère can control how long water levels will stay high; usually the water is allowed to drain around May. In the past, you would have spring floods with three or four feet of water, and the water in the floodplain would stay high for a while. Now, the air is warmer, so the water stays for a shorter period. Here, you can see some fish ponds, and you also saw the water level control structure. The water level control structure is designed to retain water and give fish longer to lay their eggs, and fry more time to hatch. Around May, the ministère opens the structure to let the fry out. There's a wooded area behind me. We hunt deer there too. This year, hunting season starts on September 29, then runs for three weeks. The first three weeks are reserved for bow and crossbow hunting. Then hunting is closed for two weeks, and starts again in November. The first week is for bow and crossbow hunting, and the second week is for hunting with firearms. Here, we only hunt with firearms. We use black powder guns and 12-, 16- or 20-gauge shotguns, but we don't use rifles. Let's talk about hunting ducks in the marshes. We have 15 marshes that we rent out to people with dogs. It's easier if hunters come with their own dogs, because then we don't need to go with them on the hunt. Why do hunters need dogs? All of these marshes are surrounded by woods. If you shoot a duck and it falls in the woods, and you don't have a dog, you'll never find it. That's why the Regroupement des Sauvaginiers requires that hunters bring a dog. If a person rents a marsh but doesn't have a dog, they have to be accompanied by a person with a dog that will retrieve fallen birds. The headquarters of the Regroupement des Sauvaginiers are here at the Centre d'interprétation de Baie-du-Febvre. This is also where we hold our youth courses. For the purposes of our organization, youth means kids between 12 and 17 years old. We focus on recruiting kids in this age group for our two-day courses. We offer a firearms safety course, which is a federal course. When kids turn 18, they can apply for a licence to buy and own firearms. That course is given on Saturdays. On Sundays, we offer an introductory course on hunting with a firearm, offered by the provincial government. When they complete the course, they receive a certificate which allows them to purchase a hunting licence. If they pass both courses, we take them to Club Landroche in June for target shooting. At the same time, we show them how to handle firearms. We tell them that there's a difference between children and adults. "You're holding a firearm now, so we think of you as an adult." If they want to, we take them hunting on the Baie-du-Febvre community pasture. There is a youth hunting day before the season opens. For us, hunting season opens on September 22. But youth can go hunting a week earlier, starting the previous Saturday. So we take them out hunting. I go with my little dog Angie there, and I take two of them out into a marsh and have them hunt. That's one of the things we do at the Regroupement des Sauvaginiers du Lac Saint-Pierre.